Facebook is one of the most popular social media platforms with 1.71 billion active users as of the second quarter of 2016. That is 1.71 billion people who have logged in within the past 30 days and who could potentially see your business. But how do you use Facebook correctly for business and avoid Facebook jail? Let’s first look at how to get your business on Facebook. The best, and safest way, to place your business on Facebook is either through a Page or a Group. Facebook dislikes people using their personal profiles to advertise business, so creating a Page linked to your personal profile is specifically created for that reason. On a Page you can choose a category as well as up to 3 sub-categories in which to advertise your Page, the sub categories are determined by the main category so make sure you choose the most relevant to your business. If you add your business address you can also place a map in the sidebar so that others can locate you as well as if there is any parking available on site, perfect for location based businesses. Other details such as opening hours, price range and contact details are also added so consumers know all they need to about you. A Page can then be used just like a personal profile, the difference being the Page is public and used for business posts rather than what you had for dinner. The occasional personal post can allow consumers to see the person they are buying, just make sure you use details you are willing to go public. If you want to limit what the audience sees or maybe want to create a small community around your business, then Groups could be for you. Groups can be publicly available to all, closed – public can only see members or secret – were public cannot see anything but the Group name and type. Members can be free to add other members, however if you want to limit your audience you can control who is actually allowed to join once members refer a friend. Choosing the relevant type of group – such as Club, Support, Study group, Team or travel to name just a few – can help identify to potential audiences what your Group is about. There is also a Buy and Sell type which adds the option to list things for sale within the Group, many local communities start up Groups like this for locals to sell second hand items. If you wish for only certain posts to be allowed, or limit the days in which certain posts can be posted, such as Promo Thursdays, then you can adjust settings to require post approval required. I have found some of the best groups are those that offer support and networking, with numerous members posting issues they are having with their business and other members offering their support and advice. People buy from people and if they see you being rude, offensive, even just plain ignorant to those posting on your wall or commenting in your Group then it can put them off actually purchasing from you. 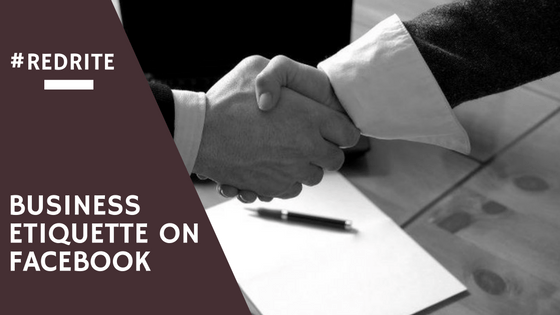 Although many users are not on Facebook to buy, through the correct and polite methods you can slowly build up a relationship with your audience. This relationship can encourage people to return to your business for their purchasing needs, either a product or a service you may offer. The biggest NO NO of all time is spamming. Posting adverts for your business within groups is perfectly fine (as long as it doesn’t break the Group rules) as long as it is done tastefully. Respect that there is not just you in the Group and spread your posts out over a period of time. Some groups, such as my networking group, only allow business advertising posts once every 48 hours. While others only allow promotional posts on specific days and posts such as a Promo Thursday post. Abiding by these rules put you in people’s good graces, ignoring the rules and you will find yourself blocked from the Group as well as seen in bad light by others within the Group. Be polite, friendly, chatty and respectful of other group members or those on your Page. The same goes for replying to comments and messages, sometimes even just a simple thank you can make the difference for your business. Facebook places a little icon on your Page for those that are fast to respond to messages including the length of time it can take you to reply to messages. Ignoring messages altogether can have you coming across rude and consumers will go look elsewhere for their purchasing needs. Keep your content fresh, if you use a Page for your business it is necessary to post regularly to a degree. If you post once every few weeks, make sure the content is valuable! Consumers like to see what a business is up to and the more you post, the more you will be seen in their newsfeed. If you do not post, you do not get seen. Sticking to these basic rules of Facebook for business and you will avoid ending up in Facebook Jail and can successfully grow your business.